Beach themed wedding cakes, ocean and seashell cakes are becoming more and more popular as destination weddings happen along the coasts of almost every country. 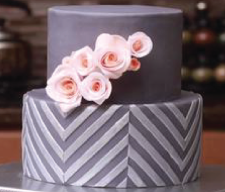 The Shell Pattern Silicone Onlay® was created to transfer a lovely repeating shell design onto cakes that instantly makes a statement of elegance and classy style. Yet, this very same design can be used to create decorated cakes that are fun and delightful which makes this Silicone Onlay® extremely versatile and handy to have whenever the need arises. Remember, most people are drawn to the sculptural grace of shells which have the loveliest lines and textures. Use the Shell Pattern Silicone Onlay® to make decorated cakes that are sure to impress your customers, friends and relatives who love all things ocean.